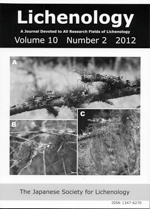 They are representatives of fruticose lichens in the subalpine coniferous forests of Japan. They usually have brownish thin branches, as in B. smithii (A), B. bicolor (A & B), B. trichodes (C) and B. lactinea. (Ref. : pp. 147-168 in this issue).